Born: 11 December 1843, Klausthal, Hanover, Germany. Died: 27 May 1910, Baden-Baden, Germany. Robert Koch, pioneer German bacteriologist, studied at the University of Goettingen from 1862 and graduated there as Doctor of Medicine (MD) in January 1866. He worked as a physician in several places for short periods, and after serving in the Franco-Prussian War of 1870-1871 became district physician at Wollstein, Posen province. Here he began his studies in bacteriology. In 1876 he published his research on the life cycle of the anthrax bacillus. He was the first person to cultivate a pathogenic organism, and the first to reproduce anthrax by means of pure cultures. In 1877 he introduced the method of making bacteriological smears and fixing them with heat. He joined the Imperial Health Office in Berlin in 1880. In April 1882 he presented a very important paper on the tubercle bacillus as the causative agent of tuberculosis. The next year he visited India and Egypt with the German Cholera Commission and identified the comma bacillus that causes Asiatic cholera. He was appointed professor of hygiene at the University of Berlin, and director of the Institute for Hygiene, in 1885. Here he gathered about him a group of keen workers, many of whom later contributed significantly to bacteriology. 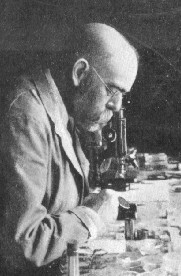 In 1890 he demonstrated that tuberculin, prepared from the tubercle bacillus, can serve both as a means of diagnosis and as a cure for tuberculosis, constituting the first step in vaccine therapy. From 1891 to 1904 he was director of the newly established Institute for Infectious Diseases in Berlin, which came to be known as Koch's Institute, and began to travel extensively in the course of his work. He propounded the theory that every bacterial disease has its specific germ, and that one germ causes one disease. On 1 December 1896 Koch arrived in Cape Town with his assistant, Dr Kohlstock*, to investigate rinderpest at the request of the Colonial Office. A laboratory was established for them at Kimberley, where Koch found in January 1897 that serum obtained from cattle that had recovered from rinderpest, when injected into susceptible animals, provided temporary immunity against the disease. Soon thereafter he developed a method of immunisation against the disease by means of subcutaneous inoculation with fresh bile derived from diseased animals. The discovery was announced in February 1897 and during the next two years two million head of cattle were successfully immunised using several variations of this method. However, during this period it was gradually replaced by more effective methods of inoculation with serum, developed by A. Theiler*, H. Watkins-Pitchford*, J. Bordet*, J. Danysz*, W. Kolle* and G. Turner*. Koch left South Africa in March 1897 for India to study plague; his work on rinderpest was carried on for some time by Kohlstock, and then by Drs Kolle and Turner. His reports to the Cape Secretary of Agriculture, dated 9 December 1896, and 3 January, 31 January, 10 February, 11 March and 22 March 1897, were published in the Agricultural Journal of the Cape Colony. In 1898 he published his Reise-Berichte ueber Rinderpest, Bubonenpest in Indien und Afrika, Tsetse- oder Surrakrankheit, Texasfieber, tropische Malaria, Schwarzwasserfieber. Koch returned from India in 1897 via Dar-es-Salaam, where he studied redwater and nagana in cattle, and back in Germany continued his research on tuberculosis. He returned to southern Africa in January 1903, when he landed at Beira, Mozambique, with Drs F. Neufeld* and F.K. Kleine* as assistants, to investigate the cattle disease that came to be known as East Coast fever, on behalf of the British South Africa Company. When he arrived in Bulawayo, Zimbabwe, it was too late in the season to properly study the disease, but he none the less recognised it as a distinct disease, different from redwater, and named it African coast fever (later East Coast fever). He wrongly identified the carrier of the causative parasite as the blue tick, was unsuccessful in producing the disease with injections of blood of diseased animals, and also unsuccessful in producing effective immunisation against it. Early in December 1903 he attended a conference on cattle disease in Bloemfontein and introduced the discussion on East Coast fever. He also found time to study horse-sickness, but his method of immunisation against this disease also proved unsuccessful. This work was described in his Second progress report on horse-sickness (Salisbury, 1904), while English translations of his reports on East Coast fever (then still called Rhodesian redwater) were published in the Agricultural Journal of the Cape of Good Hope (Vol. 23-24). He left southern Africa in April 1904. In 1906 Koch was placed in charge of a German sleeping sickness commission, working on the shores of Lake Victoria in East Africa. Here he introduced the use of atoxyl, which continued to be used as a trypanocide for many years. In 1908 he travelled to Japan via the United States. Koch was awarded the Nobel Prize for physiology and medicine in 1905. He was one of the greatest of all medical researchers and the author of many scientific reports and papers, but also a controversial figure. Characterised by dogged perseverence, he led a strenuous life and produced several outstanding discoveries relating to infectious diseases. He died from hear disease and its sequelae in 1910. His Samtliche Schriften were published in 1912. Agricultural Journal of the Cape Colony, 1897, Vol. 10, Koch's reports on rinderpest. Abrams, S.J. Germ fighters of the 19th century. Adler Museum Bulletin, 1996, Vol. 22(1), pp. 4-9. Hutcheon, D. Special report on rinderpest in South Africa... March 1896 - February 1897. Cape Town: W.A. Richards, 1897 (Parliamentary Report G33-97). Hutcheon, D. Diseases of stock in South Africa. In W. Flint & J.D.F. Gilchrist (Eds), Science in South Africa (pp. 332-361). Cape Town: T. Maskew Miller, 1905. South African Medical Journal, 1896, Vol. 4, pp. 211-214, Professor Koch's visit to South Africa.